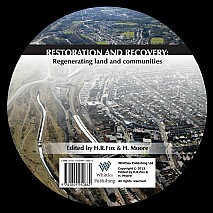 With contributions from international academics and practitioners, this International Conference of the British Land Reclamation Society, addresses the current issues and challenges for restoration and regeneration of land and communities during a period of economic uncertainty and recovery. The conference is to be held from 7th to 9th September in Pontypridd, Wales where land reclamation over the past 40 years has resulted in major transformations across the country providing new sites for commercial, residential and environmental renewal – an ideal backdrop from which to consider the technological and engineering developments that can be applied on an international scale. It will focus not only on the technical aspects of land restoration but also on regeneration including planning and community involvement in the successful environmental, economic and social recovery of such sites. This book provides a timely assessment of this important topic with an all-encompassing and multi-disciplinary coverage. As such it will be of use to geotechnical and environmental engineers, environmental scientists, chemists, planners and all those with an interest in this sector. It will form a very useful reference for students of land use, reclamation and restoration.